Used for treating kidney stones, gallstones and urinary stones (a recognised traditional use). May increase bile secretion and stimulate the digestive system. In liver disorders for its hepato-protective role, particularly in the case of alcohol intoxication, over eating and the after effects of hepatitis. For treating lithiasis (calculi) of all origins (an old and acknowledged use). As main anti-hyperlipidemic treatment and as an additional hypocholesteroleming treatment. For improving peripherical micro-circulation and capillary resistance (heavy legs, arthritis, blotchiness). For increasing biliary secretion and for stimulating the digestive system. It should be noted that the hepato-stimulating and hepato-protective actions of chrysantellum americanum are such that it enables the liver to eliminate alcohol two to five times more rapidly (take two to four capsules with the alcohol). Here is a product that any road safety commission would do well to study! 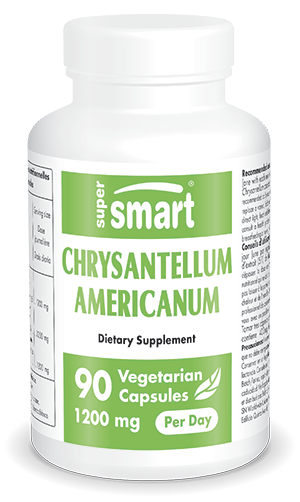 Each vegetarian capsule contains 400 mg of (5:1) Chrysanthelum americanum extract.